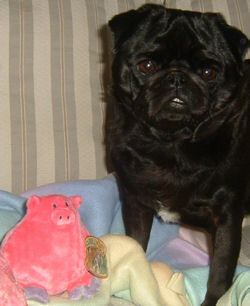 I am looking for a pink pig that I purchased at Target about 3 years ago. The brand name is Cuddle Zone. My reason for wanting it is not as important as others that I have read on here, but it is still important. My dog loves this pig. We bought three of them, and he is on his second one already, and it is on its last leg. My dog is only 4 years old so I don’t want to give him the last one we have already. He carries this thing everywhere. We call it ‘piggy’ and if you tell him to go get piggy, he knows exactly what we are talking about. He brings it to bed with him and carries it all over the house. Anyway, if you could offer any help in finding another one, it would be greatly appreciated.